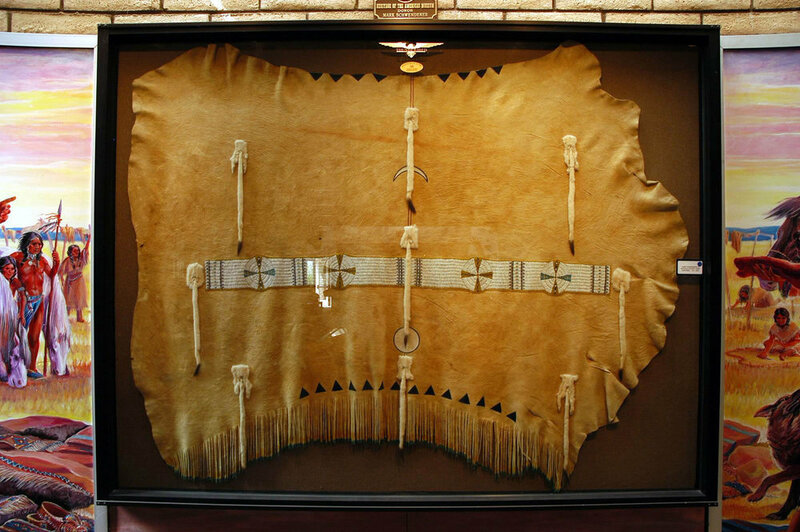 The third stop in your journey through time is the Anthropology Wing, where you will be afforded a glimpse into the daily life of the Cheyenne, Eskimo, Hopi and many other Native American cultures. Of particular interest are the headdress given by the Sioux Nation to Charles Lindbergh, Cheyenne Chief Thunderbird's buffalo council robe, and a Nez Perce dentalium shell dress. Colors seem to dance throughout the anthropology wing where eagle feathered headdresses and dance regalia, along with buckskin clothing and accessories, are exhibited. You will find North American and Peruvian Indian clothing, jewelry, war bonnets, moccasins, breast plates, and an exquisitely beaded baby carrier. Visitors will also find a display of brightly colored trade beads and necklaces, pipe tomahawks, and a collection of early guns. These items instill a vibrant sense of the lives and history behind them.